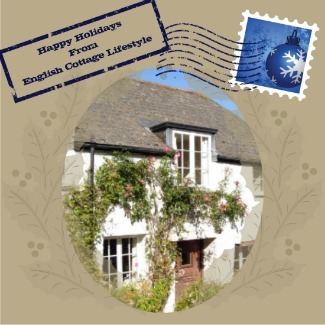 Welcome to English-Cottage-Lifestyle.com monthly E-zine…Inspiration and ideas to help you discover and enjoy the English Cottage Lifestyle. 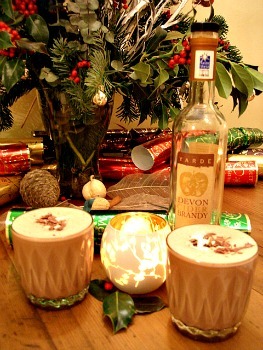 Recipe Of The Month: "Devon Velvet"
Christmas cottage 2011. Merry Christmas if you celebrate it, if not Happy Holidays from English Cottage Lifestyle.com I have made a special greeting card for you all, with a little help from Picknic.com see above. The cottage was in Dittisham in Devon a wonderful village on the river dart, close to Dartmouth. The village is across the river from Agatha Christie’s old gardeners cottage on her Greenway Estate. 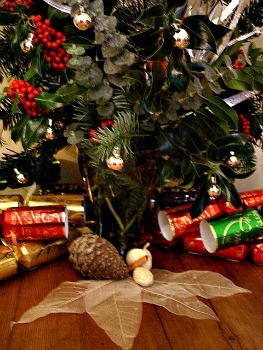 Traditionally evergreens were used in decorations inside the cottage. It was the Victorian’s who invented Christmas as we know it. They had the idea for the first Christmas cards, Christmas pudding and wrapping and giving away presents. Goose was traditionally cooked at Christmas, the Victorians cooked turkey. This time of year has always been a time of feasting and celebration. It was a time when making merry was encouraged and if someone was very poor, the one time of year when generosity would be shown, no body would go hungry on the estate or farm. It made the cold winter months bearable and prevented depression and hunger. Everyone looked forward to it even if it was a huge amount of work. So don’t feel guilty if you over indulge, historically speaking, it’s expected of you. The theory being, if you can’t eat and drink and make merry over Christmas, then when can you? Tis’ the season to be jolly. Christmas is the time of year when the garden may look a little gloomy after all the colour of the seasons but if you have any evergreens or plants with berries in your cottage garden they can look lovely as winter arrangements, you don’t even have to celebrate Christmas to enjoy the greenery around your cottage. You can also find interesting ivy and plants in the hedgerows for your arrangements. If you do not have any evergreens in your cottage garden your local florist will give you plenty of inspiration. 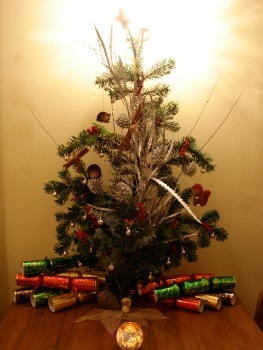 This year I made a small Christmas tree from evergreens that I had the rest came from my florist here in Dartmouth. I was like a child in a sweet shop! I know its cold but spare a thought for your plants and any birds and wildlife that needs your help over the month. Its time to put on a warm jumper and coat and prepare your garden for winter. So grab your diary and organise your to gardening do list with ECL’s December calendar. So grab your diary and organise your gardening to do list with ECL’s December Calendar. 1) You will need a wreath ring. This is two circles of wire held together with a strip of wire separating the two circles a few inches wide. You can buy a wreath ring at most garden centres or online. It will also need to have a hanging ribbon. 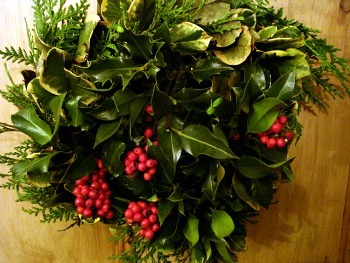 2) Wrap the wreath ring with moss (which should be damp beforehand) and secure with florists wire. 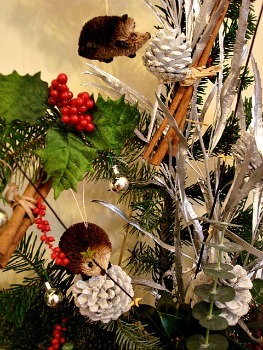 3) Add a few twigs into the wire to secure your embellishments. 4) Decorate with ivy, evergreens, holly, berries, Chinese lanterns add anything you like if does not have to be a cottage plant. The whole effect will look natural and ‘cottagey’. 5) Hang on your door or wall. If you are worried about getting the wall dirty place a brown paper bag or florists paper behind it. It may need a drink of water once a week. It will keep better outside. This is sooooo delicious on a cold winter day or night. It is really decadent, but as my other half said…”It’s the most delicious drink I have ever had” Go for quality ingredients here, it will make a difference. Organic chocolate curls for topping. 1) Whip the double cream to add air. If you are using whipping cream whisk until it hold’s its shape. 2) Add the milk into a saucepan and add the cocoa powder and chocolate squares. Warm up and whisk gently until melted. Bring to a boil. 3) Remove the saucepan from the heat and then add the Devon Cider Brandy and the double cream that you just whipped. Stir gently for about a minute to make sure it is blended. Great ideas for gifts can be found in small shops and market stalls. Here in Dartmouth we just celebrated ‘Candlelight Dartmouth’ a festival held every year to mark the Christmas season. There were many cottage industries selling homemade bath bombs, candles, soaps, leather bound note books and preserves. Any one of these are great to put in a stocking or under the tree. You may even want to treat yourself . …SBI or Site Build It! I love SBI they teach you how to build an online business the correct way. Everything you could possibly need to build your cottage industry. It is the only recommendation I would give for building a website. It’s the gift that keeps on giving and right now there is a Two-For-One Holiday Special. There’s never been a better time to try SBI. Buy one and get one free! This offer is only till the 25th December 2012 Do you know someone with a cottage industry? Are you working off your kitchen table? With your own website you control your life, no boss, no meetings, no commuting. You control your financial future. Go here to try SBI and get Two For One. You can keep one and give one away if you like…What a great gift. Here’s the link for more information. It is my sincere hope that the information I provide on English-Cottage-Lifestyle.com assists you in finding inspiration from the English cottage and country life wherever in the world you may be. Comments? Ideas? Feedback? I’d love to hear from you. Just reply to this E-zine and tell me what you think. Use the information on this site entirely at your own risk. No responsibility is accepted for any reliance on information contained on this site. Click here for the Disclaimer. Your use of this site indicates acceptance of its terms. © Copyright 2010-2012.